DENVER—Results of a new survey from the National Endowment for Financial Education® (NEFE®) on tax filing in 2019, find that among the 74 percent of U.S. adults who have filed taxes, two in five (42 percent) are happy with the outcome, while an additional 25 percent are neither happy nor unhappy. One third (33 percent) of those who have filed say they are unhappy with the outcome of their tax filing this year. The survey was conducted online in March 2019 by The Harris Poll on behalf of NEFE, among more than 2,000 U.S. adults. More than half (53 percent) of those who have filed federal and/or state taxes as of March 18, 2019, owe money this year. Half of U.S. adults who owe on taxes will not pay their taxes from savings, but will rely on other methods. About four in five U.S. adult taxpayers who have already filed their federal and/or state taxes (81 percent) are receiving a refund. Many refund recipients plan to save it and/or pay down debt. Fifteen percent plan to put it toward home improvements and 12 percent will use it to make a car repair. “Getting a large payout such as a tax refund is a great opportunity to make progress on financial goals such as paying down debts and starting an emergency savings fund,” Hensley says. 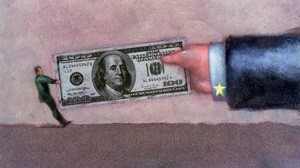 For tips on what to do with a tax refund and how to adjust tax withholding, visit www.smartaboutmoney.org. This survey was conducted online within the U.S. by The Harris Poll on behalf of the National Endowment for Financial Education March 14-18, 2019, among 2,015 adults ages 18 and older, of whom 1,468 had filed taxes already at the time of the survey. This online survey is not based on a probability sample and therefore no estimate of theoretical sampling error can be calculated. Please contact for complete survey methodology, including weighting variables.